Ministers and representatives from 56 OIC Member Countries attended the summit and expo, which hosted around 250 exhibitors, from 72 countries. The summit and expo was organised by the Standards and Metrology Institute for the Islamic Countries (SMIIC) and the Islamic Centre for Development of Trade (ICDT) in association with Discover Events, under the auspices of HE Turkish President Recep Tayyip Erdoğan. Top brands from around the world working on halal products and services in all fields including food, finance, cosmetics, tourism, chemicals, packaging, machinery, Islamic lifestyle and modest fashion, etc., participated. The summit and expo gathered institutions and organisations operating in the field of standardization of halal products and relevant actors of the halal sector seeking business and partnership opportunities in the OIC Member States. It provided a platform to promote products and services and to boost investments in this sector. 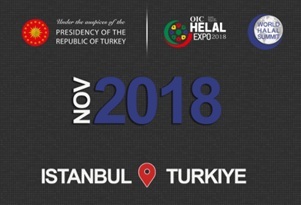 The OIC Halal Expo is the world’s largest halal event and is a unique international business platform for professionals and buyers from Turkey, Middle East, Central and Western Europe, Balkan region and Africa. The global halal food industry is expected to witness significant growth in the near future with the increase of the Muslim population and their increasing expenditures on food and beverages, which are considered as the main driving force of this market. In addition to its religious values, the consumption of halal food is related to some of the central tenets of Islam, including the preserving of life, safeguarding future generations, self-respect, dignity, etc. In addition to this, health and respect for animal welfare have been an important driver.